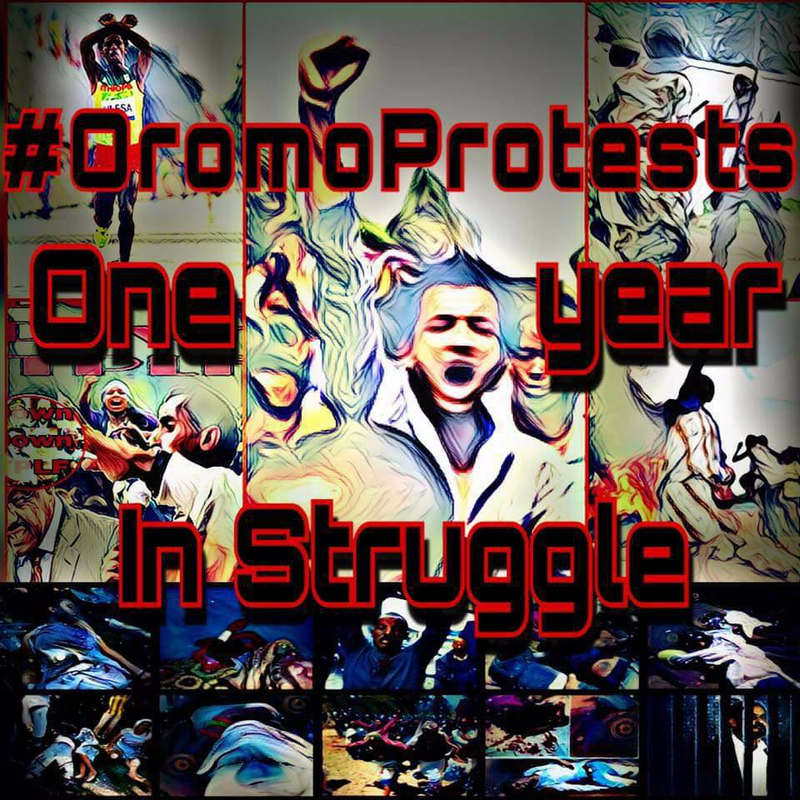 Posted by OromianEconomist in #OromoProtests, Uncategorized. Under the false impression that the TPLF/EPRDF are adequately democratic entities, the global community continues to uphold support and offer aid to the government. In the 2015 general elections, the ERPDF won one hundred percent of parliamentary seats. in the previous election the party won 99.6%. Election results like this one reveal that the government is, in all reality, authoritarian, masking their lack of democratic principles with elections as well as the elimination of rivaling civil society groups and independent media. Equity statement: Accurate information on African politics and culture is extremely difficult to attain. Western countries routinely delegitimize African professionals and news outlets by sharing biased accounts of issues occurring in African countries to African people. I have done my absolute best to adequately research and interview in order to offer the most accurate account of the political situation in Ethiopia and plight of the Oromo people. If you or a loved one is affected by the current situation in Ethiopia or Oromia, and/or you feel that any information is not accurate, please feel free to comment and discuss below. The Oromo community makes up nearly fourty million people, mainly residing within the borders of Ethiopia. The Horn of Africa, a pastoral hub, is continuously marred by its colonial history; one of the main factors creating ethnic, economic, political, and social instability today. Their colonization and fusion into Ethiopian society disrupted the established and independent, political structure of the Oromos while also placing a massive ethnic group in a subordinate position to two other smaller ethnic groups, the Amhara and Tigray. “The TPLF-dominated EPRDF intentionally included Article 39 [The right to secession] in Ethiopia’s 1994 Constitution so that the Tigray region could loot Ethiopia of its resources, use the Ethiopian military to expand the borders of Tigray, and then secede from Ethiopia”. Under the false impression that the TPLF/EPRDF are adequately democratic entities, the global community continues to uphold support and offer aid to the government. In the 2015 general elections, the ERPDF won one hundred percent of parliamentary seats. in the previous election the party won 99.6%. Election results like this one reveal that the government is, in all reality, authoritarian, masking their lack of democratic principles with elections as well as the elimination of rivaling civil society groups and independent media. Peaceful, anti-government protests erupted across the Amhara and Oromia regions following the election results. Between November 2015 and August 2016, at least 500 protesters were killed by security forces and thousands detained under terrorism charges. Successive government leaders have been cited by Human Rights Watch and Non-Governmental Organizations (NGOs) for human rights abuses as well as non-democratic and severe “iron-fistedness” against dissension; such as, “the Charities and Societies Proclamation of 2008. This restricts Ethiopian non-governmental organizations from embarking on any human rights-related work if they receive their funding from foreign source” according to Adeyinka Makinde of Global Research. The EPRDF has the capacity to stamp down any and all forms of dissension due to its “full control of the security apparatus, the military, the police force and the intelligence services, dominated by ethnic Tigrayans”. EPRDF also legitimizes the use of extreme force under its “vaguely drafted counter-terrorism laws”. The most recent protests and government crackdown have entered international focus with figures such as Olympic silver-medalist Feyisa Lilesa crossing his arms in solidarity with the Oromo people during the Rio 2016 Olympics. 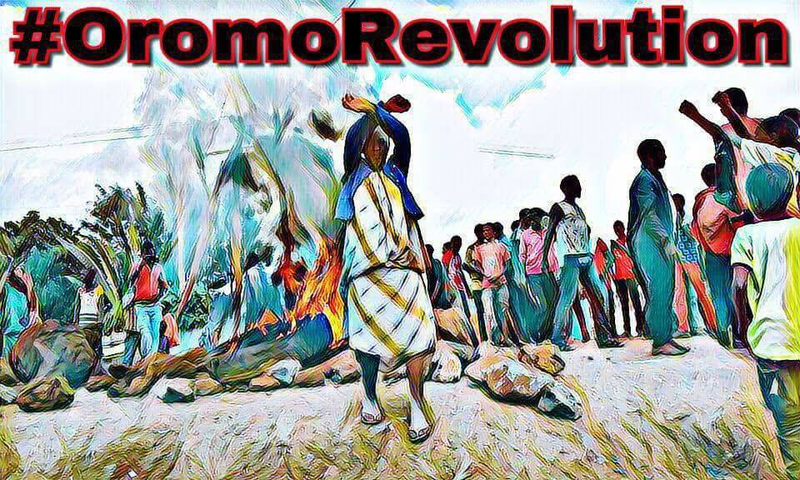 The Oromo people endured oppression for the past century; the question remains as to why, finally, the Oromo peoples’ protests have gained traction. 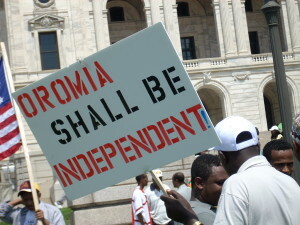 In an interview with Gemechu Mekonnen, an undergraduate student studying at the University of Minnesota Twin Cities, an Ethiopian, and an Oromo, he explained that the oppression of the Oromo people reached a tipping point around a year ago when the government planned to enact what is coined “The Master Plan” to seize Oromia land. Farmers around the capital would in turn, lose their source of income with little to no compensation while the government sold their property, arguably for some the most fertile land in Africa, to foreign investors such as China. The lack of representation, subjugation and oppression of the Oromo group by ethnic groups such as the Ahmara and Tigray resulted in an “unsurprising amount of frustration and resentment”. 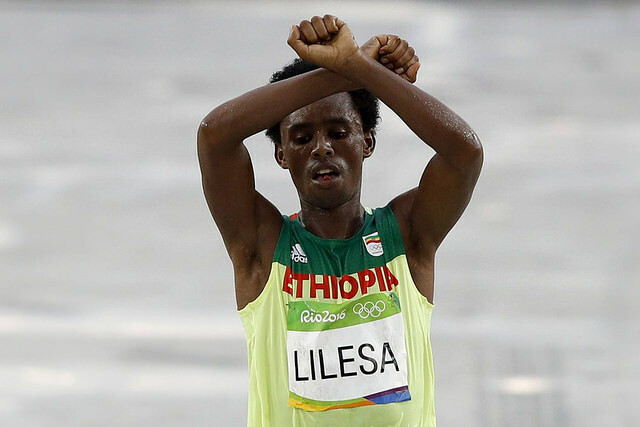 the Ethiopian government had, “already taken the dignity, voice, and lives of so many, [that] the Oromo people finally said ‘enough is enough’ to the government’s unjust actions”. “The ‘why now’ really comes rooted in many different now. Whether it’s the influence of globalization revealing more of the world to Ethiopians [and to] Oromos, the emboldened and educated students and youth [who] question the status quo, or the blatant lack of respect for the land and life of their people, all these [factors] were important in catalyzing the active voices for change that now exist. The more the government tries to arrest journalist, suppress independent media, and kill opposition leaders, the more the people protest”. 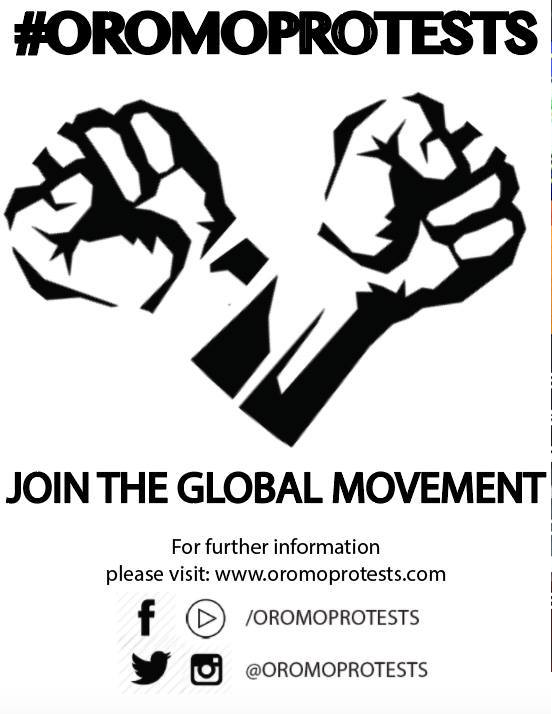 The more pressure the international and domestic community puts on the government, the greater the voice the Oromo people have to advocate or their rights domestically and on a global stage. However, signs of progress are small and incremental. On October 2nd 2016, an estimated 678 civilians were killed and countless injured by government forces in what is now infamously known as The Irreecha Massacre. Nearly two million people from across Oromia assembled to celebrate Irreecha, a festival marking the changing of seasons. Irreecha, for many Oromo, is a setting for “resistance and reaffirmation of identity” where attendees sing revolutionary songs and denounce human rights abuses. Following what the attendees considered a politicization of the festival, an individual openly defied the organizers (who were affiliated with the government) and spoke out against the EPRDF. Security forces responded by firing bullets and tear gas on the unarmed participants. Repeatedly hearing news about the tragic loss of life of his people leaves Mekonnen feeling “a sense of hopelessness”. He describes “a recurring feeling dread, not for what could happen to me, but for what is most likely happening to the family I have in Ethiopia”. The situation in Ethiopia reaches far beyond its borders. 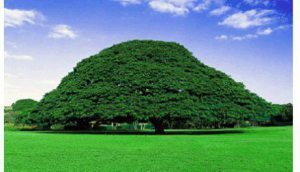 The Oromo peoples’ struggle, while inadequately understood by the rest of the world, is catalyzing what will be true, grass-roots changes. There remains much reform that needs to be done regarding Oromo self-determination and within the Ethiopian government itself, but the process has begun. 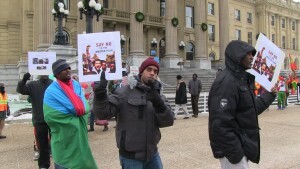 It is important for the international community to recognize the atrocities occurring within Ethiopia as well as stand in solidarity with the Oromo people and the victims of violence and human rights abuses.